A large portion of the thin section Laser welding market is traditionally achieved using flashlamp pumped solid state (FPSS) Nd:YAG Laser technology. The many benefits of the Fiber Laser such as near zero maintenance, exceptional stability and control capability and process tolerance due to the high beam quality have resulted in its adoption as the preferred technology in many precision micro welding applications. This application insight looks at various precision welding methods including; galvanometric welding and wobble welding, with in depth analysis, experimentation and results of these techniques. In many cases when precision micro welding is required, a complex 2D or 3D welding path must be followed. One way of achieving this is by utilising a galvanometric scan head with an appropriate focal length lens and aperture to achieve the weld required. In the case of the Nd:YAG Laser a large input beam diameter and short focal length lens could be used to minimise the spot size, however this also results in a shallow depth of field and limited working areas. The advent of the Fiber Laser brought with it a Laser source which has a nearly perfect Gaussian profile enabling very small spot sizes to be achieved whilst maintaining the average power required to perform within the precision welding market. When coupled with a galvanometric scanner, the capabilities of a Fiber Laser source in precision micro welding become significant over Nd:YAG technology. Fiber Lasers in this configuration provide an increase in the depth of field, working area and overall process tailoring compared to the conventional Nd:YAG systems, thereby providing improvements to process stability and an overall reduction in tooling costs per part. Due to the superior beam quality of the Fiber Laser system, the spot sizes available are smaller than the FPSS systems which allow for flexibility in the shape, size and residual metallurgy achievable using the Fiber Laser system as can be seen in Figure 1. In cases where the high power density enables the required penetration depth to be achieved, but where the small spot size cannot provide the necessary weld strength or process fit-up tolerance, a tailored approach to precision micro welding can be achieved utilising the extended parameters available in ‘wobble welding’. By taking this approach, welds created with a pulsed FPSS can be replicated faster using CW Fiber Laser. Utilising a scanning head in conjunction with a Fiber Laser enables high speed, complex welding patterns to be achieved from a single Laser source across a large processing field as can be seen in Figure 2. This is achieved by moving two mirrors inside the scan head to preprogrammed positions using a computer controlled interface. In a number of cases the weld pool generated from a Fiber Laser process is either too small or the part alignment is such that the spot size is too small for the process in hand. Therefore a ‘wobble welding’ process can be employed to achieve the desired result, engaging a number of welding parameters unavailable without the combined use of a galvanometric scan head and Fiber Laser. Figure 2: Schematic of galvanometric welding. The technique of wobble welding is illustrated in Figure 3. The scan-head is used to rapidly rotate the beam position around the axis of the weld direction using a specified circular amplitude. Whilst a linear weld from a high brightness source is usually too narrow for thin section welding, wobbling the beam removes this issue and allows the width of the weld to be accurately controlled and tailored for the specific application. The parameters used to control the wobble welding process are different to conventional welding methods; FPSS welding utilises pulse energy, pulse duration and pulse to pulse overlap, whilst Fiber Laser wobble welding utilises Laser output power (since the Laser operates in CW mode rather than pulsing), wobble amplitude and linear weld speed. Due to the properties of the materials being processed, it is important for the circular motion to be rapid with trials indicating that a rotational frequency of at least 600 Hz is needed for a uniform weld cross-section. It is also possible to produce spot welds using this method by moving the beam in a fully circular motion instead of along a linear path as shown in Figure 4. Figure 3: Schematic of the wobble welding technique. Figure 4: Schematic of the spot wobble welding technique. It is possible to tailor the weld cross-section dimensions when using the wobble welding method by modification of the process parameters. 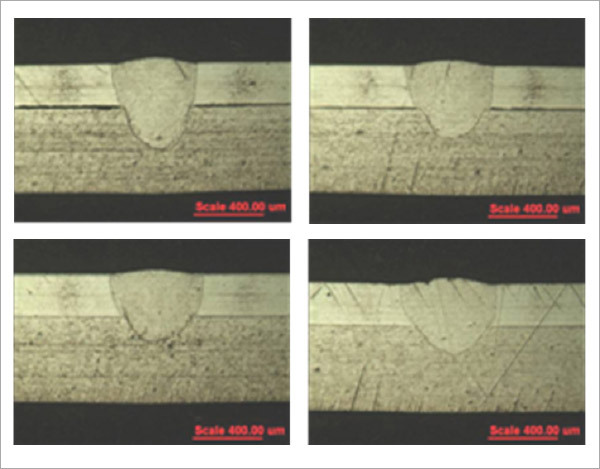 Figure 5 shows four weld sections using the same linear welding and wobble speeds and the same Laser power. The parameter that is modified is the wobble amplitude; smaller and the weld section becomes narrower and deeper, larger and the weld becomes wider and more shallow. Figure 5: Weld dimensional control using wobble amplitude with constant energy input. In order to understand the repeatability of the wobble weld process, 30 welds were made using a 250µm thick stainless steel upper material and a 500µm base material. The process was undertaken using a redPOWER 200W Laser operating in CW mode. The scan head was operating at 1000Hz wobble frequency, +/- 100µm wobble amplitude and a linear weld speed of 30mm/s. A cross-sectional image of one of the weld examples can be seen in Figure 6. Figure 6: Example of the wobble weld repeatability set. Statistical analysis of the results can be seen in Table1. These show a standard deviation of 4.8%, indicating that the process is repeatable under controlled conditions. 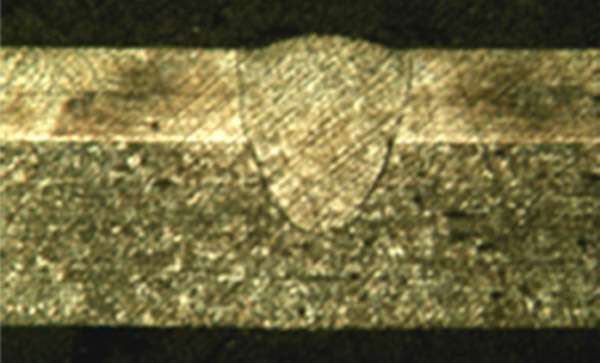 For thin section micro welding, Fiber Lasers can be used to produce welds which match those made by older Laser technology but with the advantages of a larger working depth of field which gives a greater process tolerance and the ability to tailor these results to the requirements of the application. Fiber Laser processing also brings additional benefits such as increased reliability and cost-effectiveness. The wobble welding process in linear and spot welding has been demonstrated to be a highly repeatable process. This brings a high degree of flexibility and control by allowing the dimensions of the weld cross-section to be determined by the scan head settings. This is due to the excellent stability and repeatability of our redPOWER Fiber Laser series.